Schmertzler is a master story teller. He boils our times and its events into a comprehensive whole that exposes the players and illuminates the connections between them. He follows his own interests but is also open to make commissioned works for your home, office or publications that illustrate suggested subject matter. Artwork is available for exhibition and sale. Make your event stand out with live caricature entertainment by booking Allen Schmertzler (Let's Face It). Booking info here. "My political art, "New World Disorder" became too real. I lost the country I knew, then I lost my parents. It was almost too much. To survive during so much crying and lying, I did the only thing I knew how - I kept to a strict diet of daily writing and drawing. 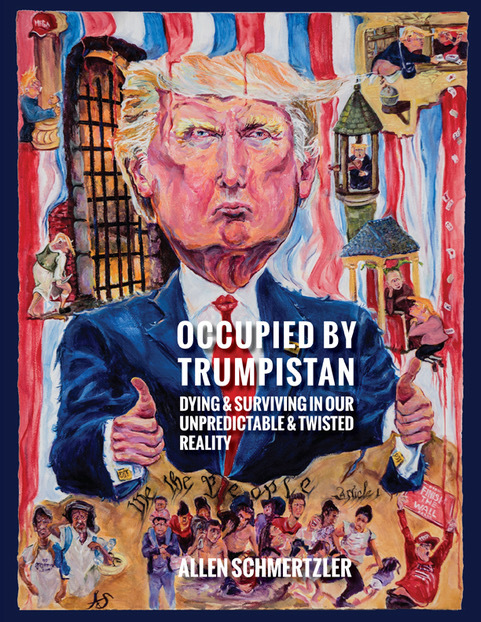 "Occupied by Trumpistan" chronicles my personal - and the nation's journey back to sanity - from Trump's escalator shocker to the nation's 2018 cathartic election of hope. Order now at <allenisartist@comcast.net> and receive my special offer: hand drawn - personalized signed book/s. In the multifigured paintings with complicated compositions, the action takes place where food, drink, and social gala activities are likely to unfold with dance, music, movement and social drama. He frequently paints himself into the scene but as the distant viewer observing with anticipation and stoic empiricism, to create a bit of humor as the straight guy who doesn't fully engage in what is happening and/or even his disdain for it. The drawings aren't as complicated as the paintings but are still complex enough to give a punch. Allen Schmertzler has a point of view and he isn't afraid to visually voice it. Schmertzler is currently working on a new book, a caricatured interpretation of the Trump Presidency. Schmertzler averages 12-14 original live caricatures per hour. He is a talented artist and a charming entertainer.